852089 Mr. Freeze Minifigure Magnet Set is a Batman set released in 2007. This is a description taken from LEGO.com. Please do not modify it. Keep things cool on your fridge with Batman! Here's a riddle: when is a fridge cooler on the outside than the inside? When Batman battles Mr. Freeze and the Riddler there! 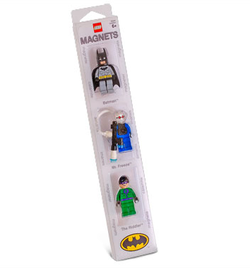 Magnet set features real LEGO minifigures of Batman, Mister Freeze and the Riddler! Facts about "852089 Mr. Freeze Minifigure Magnet Set"
Keep things cool on your fridge with Batman!